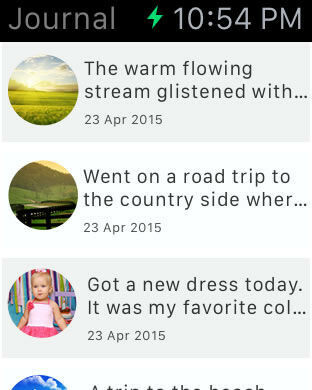 Journal is an awesome app to capture the wonderful moments of your life as they happen so that you can relive those moments later. The seamless integration between the app on the phone and watch helps you capture or view your moments at your convenience. 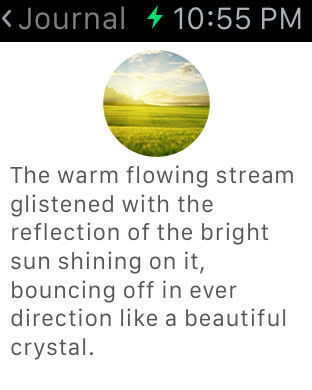 You can add a beautiful moment in your phone or view a moment in your watch. Capture a moment, add a photo, mark as favorite or share with friends, all in a few seconds with the intuitive and simple to use features which helps you to spend more time on enjoying your moments rather than capturing them. Access the options available for each moment like mark as favorite, share with friends or delete using swipes. Also the default option for right and left swipes enables you to take actions without even tapping any button. A simple but a super user friendly feature is the provision of a quick add button on the bottom right of the screen so that you can access the moments add feature in a second. The simple, clean and easy to use interface gets you started in seconds and the flow is purposely made simple and intuitive to help you focus on the beautiful moments of your life rather on the app. If you like the app, have a suggestion to improve the app or would like to report something not working, please send us an email at support@macappstudio.com. We love to hear from our customers.